Near Montgomery, Alabama 1950’s. Free TV, Spring Air Mattresses, Heating, combination bathtub and shower. There is nothing I like better than going on a long road trip. If you need to get somewhere quickly, airplanes are the way to go. 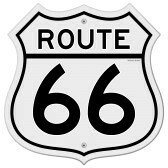 If you want to have fun, you need to travel by automobile. 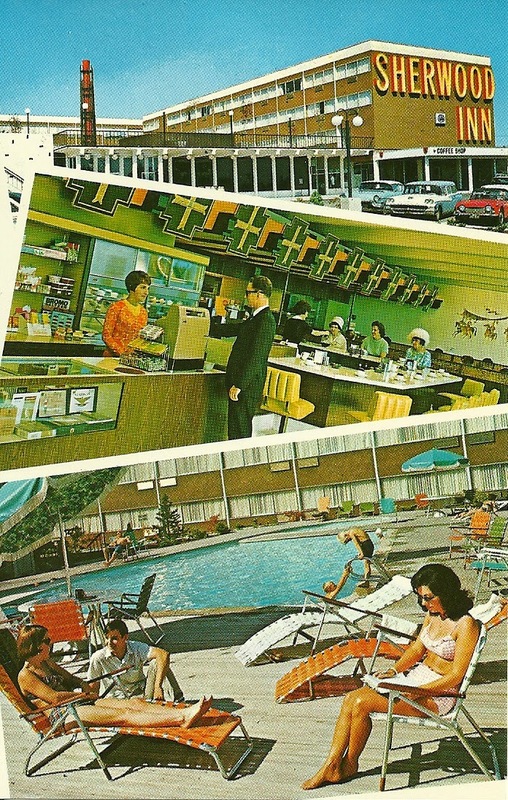 Motels used to leave postcards in the room for guests to use. It was a good way to advertise their establishment. I would always take them, and mail them to people. Sometimes I had a few left over. What you will see today, are a few of my leftover post cards. They range in age from the 1950’s to the 1990’s. 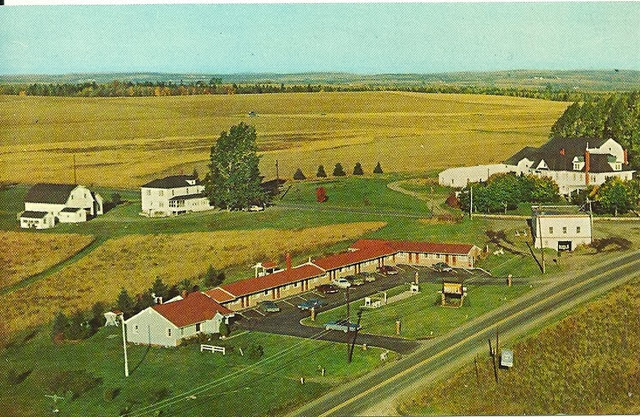 Most, but not all, of these motels still exist today. I was always wanting to stay where they had a swimming pool. If there is a pool in the photo, I swam in it! Having a large sign which could be seen from the highway was very important. Fasten your seat-belt as we travel the highways and byways of America on the open road, and look for a nice place to spend the night. Knight’s Inn, Anderson, California 1980’s. Cable color TV. Direct Dial Telephones. All King & Queen Beds. Pool. Air Conditioning and Heating, Theater and several specialty restaurants in a complete Shopping Center adjoining. Near Bellingham, Washington, Scottish Lodge 1970’s 94 Deluxe Units. Queen size beds. Color Cable TV. Saunas. Heated Pool. Complementary Coffee. Free County Telephone. 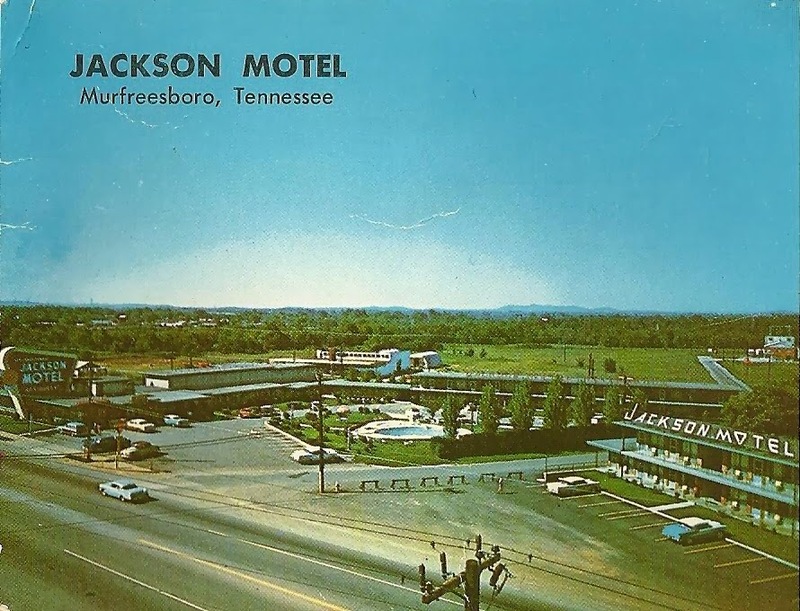 Jackson Motel, Murfreesboro, Tennessee late 1950’s. Note the decor. Accommodations for 200 guests. Swimming Pool, Air Conditioned, electric heat, Circulating ice water, and Telephones. Beautyrest Mattresses. Nice Restaurant serving good food. TV lounge, Gift Shop, Shuffleboard, and large Convention Room. Fountain Service until 10:30 PM. Frenchman’s Bay Motel, Bar Harbor, Maine early 1970’s 70 modern rooms each with an ocean view. Coffee Shop. Sherwood Inn, Tacoma, Washington 1960’s New luxuriously furnished 120 room motor hotel. Conventions. 3 Dining Rooms. Coffee Shop. Cocktail Lounge. Heated swimming pool. All Air conditioned. Today it is a gambling casino! 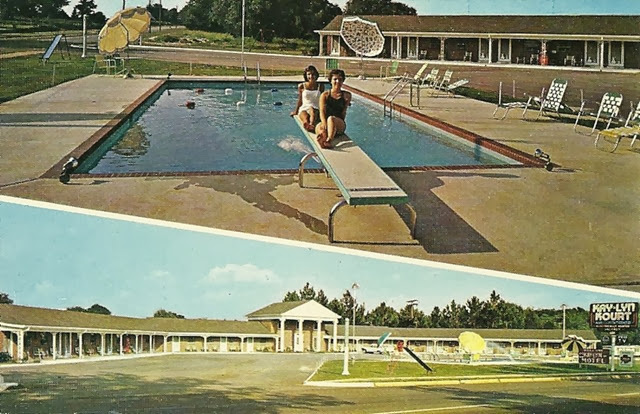 KAY-LYN Kourt, Richland, Georgia 1950’s–20 ultra modern units electrically heated, free tv, air conditioned, swimming pool. Park Terrace Motel & Restaurant, Fulton, Kentucky 1950’s. Heated swimming pool, 10 acre lawns and playgrounds, golf putting greens, Tennis Courts, Shuffleboard, Private Sun Terraces, Free TV, room telephones, Beautyrest mattresses, wall to wall carpeting, central heat & air conditioning, excellent food served. 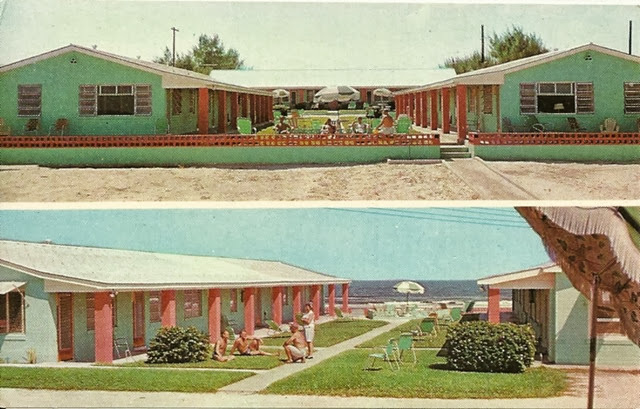 Sea Vista Motel, New Smyrna Beach, Florida 1950’s. Directly on the beach! 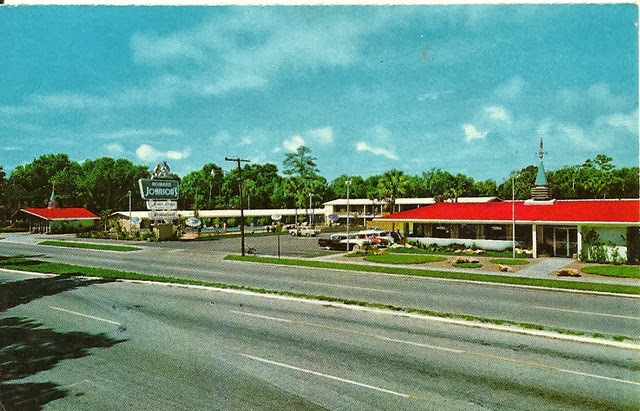 I remember this motel well! Today it is the Sea Vista Tiki Bar. 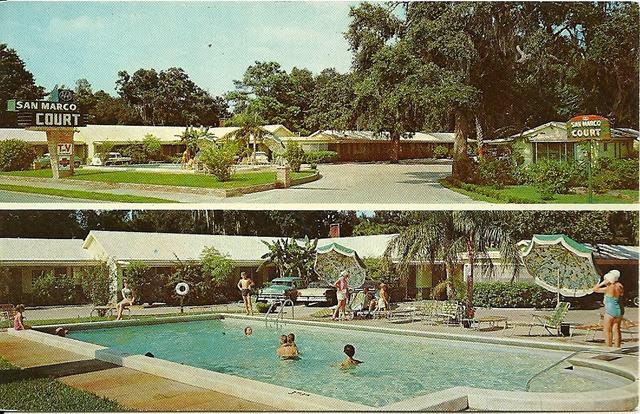 San Marco Court, St. Augustine, Florida 1950’s. 38 Ultra-modern units situated in oak grove, near restaurants, hot water heat, 100% air conditioned, Free TV in all rooms, Tile shower baths. 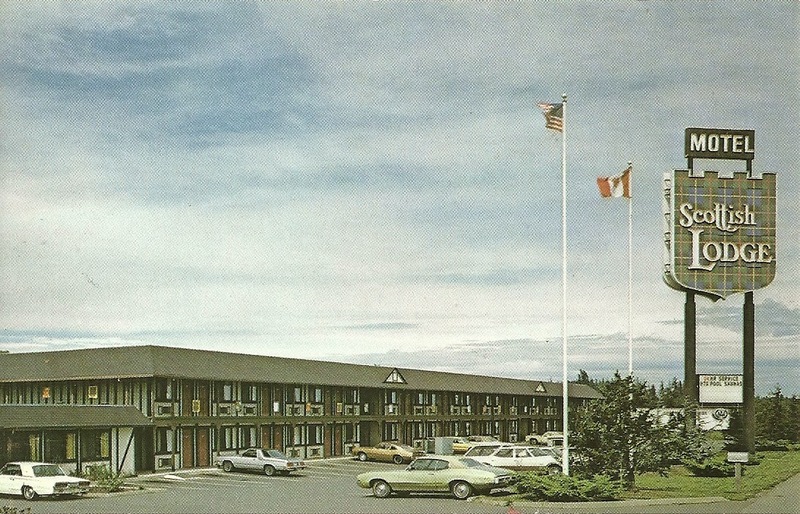 Nendels Motor Inn, Tacoma, Washington 1980’s. 155 person conference room. Restaurant. Lounge. Comfortable accommodations. Wyoming Motel, Buffalo, Wyoming 1980’s 24 Rooms. Queen beds. Non-smoking Rooms. Heated Pool with color cable TV HBO. Heat and Air Conditioning. Telephones, laundry, picnic area. Playground. Game room. Truck parking. Coffee Shop. Restaurant. Airport transportation available. Generic Howard Johnsons. 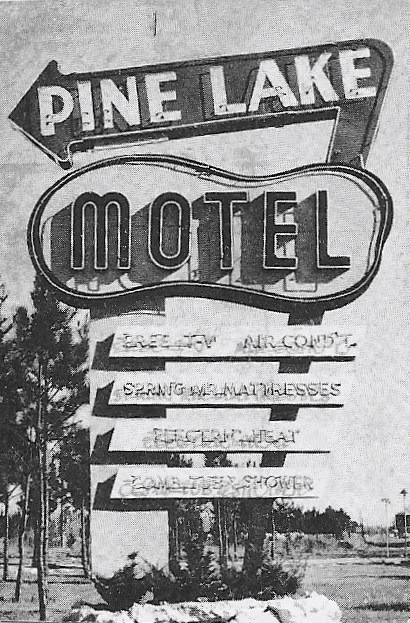 I loved their motels and attached restaurants! They boasted 31 flavors of ice cream. The orange roof and steeples were a welcome sight for weary travelers. 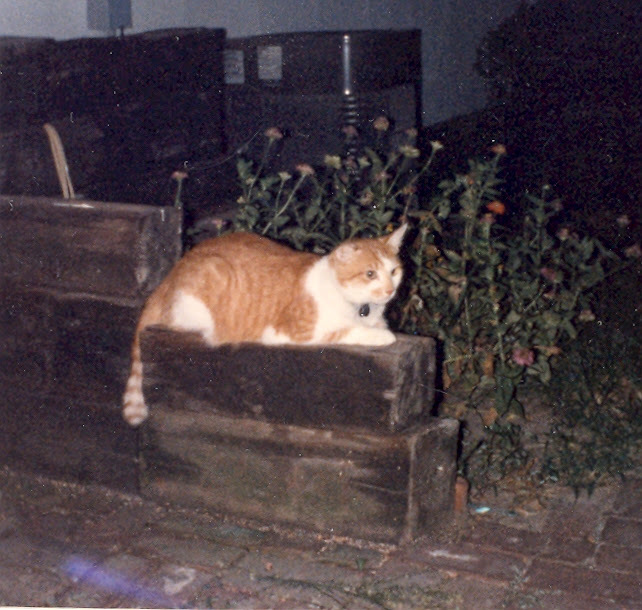 My cat Tiger was a real traveling cat. He went on road trips in the backseat of the car for journeys over 1000 miles. He was very good in motels. I would set up his litter box in the bathroom. Before I left, I would completely clean up this area, so no one would ever know he was there. Some motels would allow pets, while others would not allow pets. Sometimes I would just sneak him in. We arrived late, and left early the next morning, so we did not have to deal with maid service discovering his presence. He escaped from the auto at a rest stop once, but was quickly scooped up, and returned to the car. In Kansas we had a tornado. They say that the safest place to be is in the bathtub. There was not enough room for us all, so we just put Tiger and his carrier in the tub. At least one of us would be saved! The tornado missed us barely. 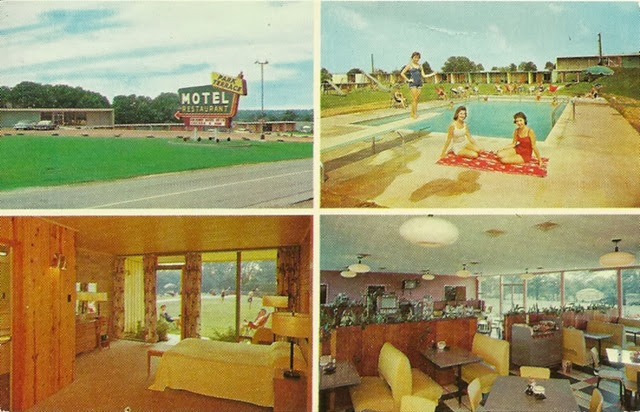 NOTE: I have no more old American motel postcards. There will be no more posts about them. Those traveling days are great memories for me. Thanks for your comment.